Mark came home last week. Both of the boats are literally falling apart, one of them while en-route to Annapolis, so let’s just say the homecoming was not entirely joyous the first few days. And, of course, in the midst of all this chaos I decided to pick the perfect time to comment about maybe not wanting to change my last name … at least not right away. Maybe it was the timing, but I had no idea it was it would become an issue. Mark has a really beautiful last name. It’s English and Scottish (Side note: I’ve been begging him to wear a kilt at the wedding and he refuses. I tell him Gerard Butler probably would. That argument doesn’t seem to make the kilt any more appealing … to him at least). However, his surname has one thorn. The beloved, and often missed and misused hyphen. 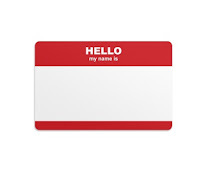 So, unless I want the world to explode or, at the very least, have every airline ticket counter worker want to shoot me in the head, I will not be hyphening my maiden name with his already hyphenated last name. I’ve always assumed I’d take my husband’s last name. Never a doubt. However, when it comes to actually, legally changing it, I hesitate. For 26 years, I have been signing it. It was on my high school research paper that I proudly aced. It’s accompanied my first name on bylines of article and short stories I’ve written. It was on the back of sports jersey and sweatshirts. Friends called me it in college. It’s on my diploma. It’s been attached to honors and awards. It’s me! I am a very traditional person, and I have no problem with the traditional husband and wife roles. I don’t really care if Mark trades his goats for my hand in marriage. I really don’t want to take care of the goats anyway. But it seems like losing my last name would mean losing my identity. Maybe I am reading too much into it or being too sensitive or too prideful. After all, a lot of my friends changed their middle name to their maiden name in order to take their husband’s surname. And I’m not against people calling me by the new name. I’m just more concerned about legally losing it. I love Mark, and it’s not about him. I know it’s about surrendering myself to the idea that I am no longer an individual in the sense that once September 18 roles around, Mark and I are officially a team – with the same last name on the back of the jerseys.